Chris Metzger, United States Marine Corps Staff Sergeant, has used App Inventor to create an app that helps other Marines destroy weaponry captured in the field. In his words, he is “creating an app that calculates net explosive weights so that [his] fellow Marines can utilize it in country to destroy explosives and ammunition, and do it safely.” This striking example of personal use of App Inventor shows how mobilizing and empowering it is for anybody to be able to create an app easily and quickly. 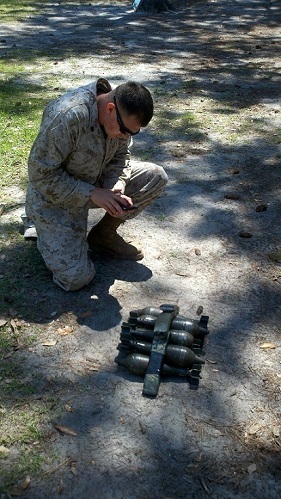 Pictured is USMC Sergeant Jeremy Kinsey using Metzger’s app and kneeling by a “stack of captured enemy ammunition with C-4 explosives placed on it in preparation to dispose of it,” according to Metzger.